Being sworn in as a Notary Public in your state is a big responsibility. We at Notary Supplies Online are dedicated to supplying you with top-of-the-line and user-friendly products along with great customer service and fast shipping. By using one of our PSI Pre-Inked Jurat stamps, your job will be made much easier. As a notary, if you are witnessing a signing of a document and administering an oath, your state may require you to document the event. Check out our Pre-Inked Jurat stamp with pre-printed verbiage. We take care of the necessary wording and all you have to do is fill in the personalized information! If you are looking for a light weight stamp that is both sturdy and eco-friendly, look no further. 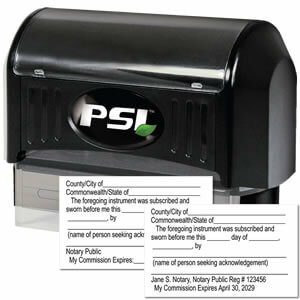 We offer PSI Pre-Inked Jurat stamps for all notaries. This PSI Pre-Inked Jurat Stamp gives you 3 to 5 more impressions than a traditional self-inker without the use of an additional ink pad. Without the need for replacement ink pads, the PSI Pre-inked process reduces plastic, foam and ink from going to landfills. This pre-inked Jurat stamp comes standard with a clear base which assures the perfect placement of your imprint every time.